This code sample demonstrates the different types of menus available in Android and its ActionBar. The Options Menu, Popup Menu, and Sliding Menu/Flyout Menu. a) Create menu .xml file and must be located in a menu folder under resources and the menu items are as below. b) OnCreateOptionsMenu function is available in Activity, override this method and associate the menu.xml to MenuInflater as below. c) The next setup is implementing the method that will fire when one of the options of the menu is clicked. That is done by overriding the OnOptionsItemSelected. In above function, respective viewmodel methods are being called when each menu item gets selected. When you create the options menu as explained above and actionbar does not accommodate with all the menu item icons, then you see overflow image in Actionbar, when clicks on overflow image, menu will be opened as popup as shown in below image. When you are implementing a Custom ActionBar where you want to implement the Popup menu, follow below steps. a) Create menu.xml file as explained in section 1.
c) OnCreate function of activity find the imagebutton, associate the menu.xml to PopupMenu and open the PopupMenu when clicks on imagebutton as below. d) Refer the below screenshot for custom actionbar with Popupmenu. The idea is to put the navigation menu of your application in an initially hidden drawer that can be revealed by a button click or a horizontal swipe as shown in below screenshot. 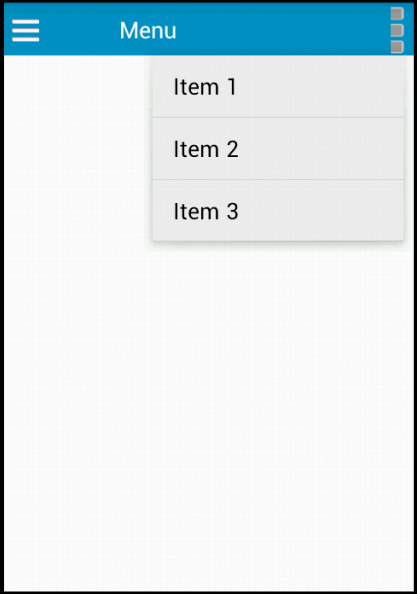 In this case, menu is implemented as FrameLayout containing two items, the Menu view and Content View. This FrameLayout is responsible for showing the menu. From above, outer layout is a custom FlyoutContainer class created to handle the two views, one for menu which ID will be FlyoutMenu and one for the Content view which ID will be FlyoutContent. Sample Menu Layout is created with ID FlyoutMenu as below. 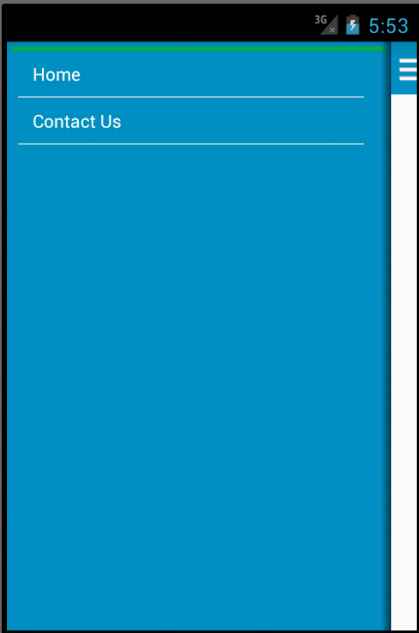 Sample Content Layout with Custom ActionBar in Frame Layout and Content view with ID as FlyoutContent as below. b) In OnCreate method of Activity, write piece of code to open the sliding navigational menu. Please download the working sample from below link.